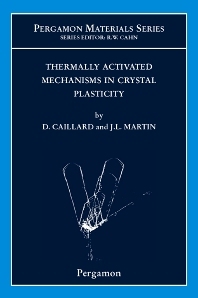 Thermally Activated Mechanisms in Crystal Plasticity is a unified, quantitative and fundamental resource for material scientists investigating the strength of metallic materials of various structures at extreme temperatures. Crystal plasticity is usually controlled by a limited number of elementary dislocation mechanisms, even in complex structures. Those which determine dislocation mobility and how it changes under the influence of stress and temperature are of key importance for understanding and predicting the strength of materials. The authors describe in a consistent way a variety of thermally activated microscopic mechanisms of dislocation mobility in a range of crystals. The principles of the mechanisms and equations of dislocation motion are revisited and new ones are proposed. These describe mostly friction forces on dislocations such as the lattice resistance to glide or those due to sessile cores, as well as dislocation cross-slip and climb. They are critically assessed by comparison with the best available experimental results of microstructural characterization, in situ straining experiments under an electron or a synchrotron beam, as well as accurate transient mechanical tests such as stress relaxation experiments. Some recent attempts at atomistic modeling of dislocation cores under stress and temperature are also considered since they offer a complementary description of core transformations and associated energy barriers. In addition to offering guidance and assistance for further experimentation, the book indicates new ways to extend the body of data in particular areas such as lattice resistance to glide. For academic and industrial researchers in materials science.